Senators voted 20-7 on Thursday for a bill that would allow Vermonters to register to vote right up through Election Day, but first they debated the threat of voter fraud. “How can that town clerk be assured you haven’t voted somewhere else that day?” Sen. Dustin Degree (R-Franklin) asked. Sen. Jane Kitchel (D-Caledonia), left, questions Sen. Jeanette White (D-Windham) on same-day voter registration Thursday on the Senate floor. By the time the proposed law would take effect in 2017, clerks will be able to check for updated information online, said Senate Government Operations Committee chair Jeanette White (D-Windham). Regardless, she said, no system is foolproof if a voter is intent on committing fraud. But she said there’s no indication that fraud is going on, in Vermont or in other states, even those with same-day registration. The Senate agreed to delay enacting same-day voter registration until 2017, instead of the originally proposed 2016, after complaints from town clerks. Some were worried that it would be easier for voters to get away with fraud. The Vermont Municipal Clerks' & Treasurers' Association agreed to support the bill, however, if it were delayed a year. 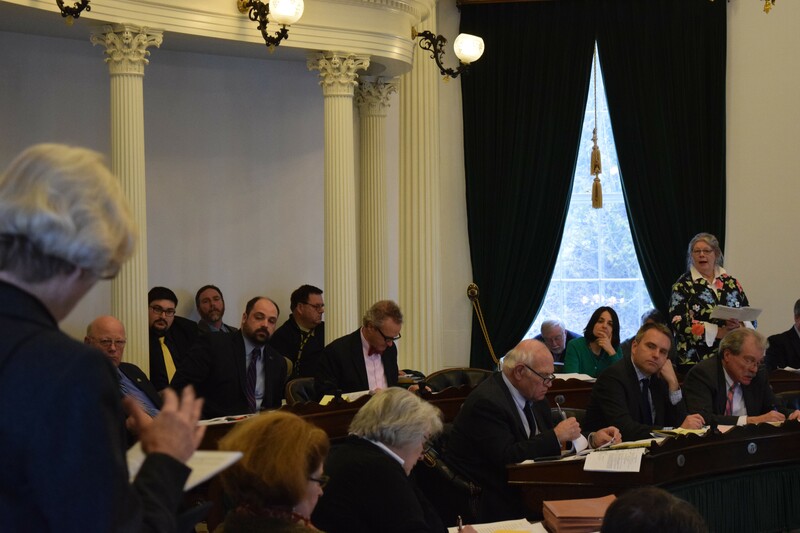 Sen. Anthony Pollina (P/D-Washington) argued that the ease of same-day registration in other places increases voter turnout on the order of 12 percent. Degree contended it wasn’t worth the risk. He noted that some elections in his area have come down to a margin of just a few votes, or ended in a tie. “I think the integrity of our elections is more important than increased participation,” he said. After another vote in the Senate on Friday, the bill, S.29, heads to the House.